Karhunmäki is the southernmost District of the Joensuu City area, being the divider between the Niinivaara District and Reijola. It is located next to Superhighway 6, though being far enough to not suffer from traffic noises. Karhunmäki's own junction on the Superhighway 6 was just recently opened in 2013. The vast lake of Pyhäselkä is only a stone's throw away from Karhunmäki, offering great possibilities for various outdoor sports, like snowmobile driving. Currently over 400 priviledged people are inhabitating Karhunmäki and by year 2030 the population is expected to be over 4,000. Assuming exponential growth, the population of Karhunmäki will be 79 million by the end of the year 2040 and the population of Karhunmäki will exceed the current population of the Earth during the year 2045 (see the model and the illustration for additional information). Unfortunately, as the picture shows, Google and most navigator devices do not yet acknowledge Karhunmäki and its valiant inhabitants. Therefore, directions to the Karhunmäki Headquarters are provided here. 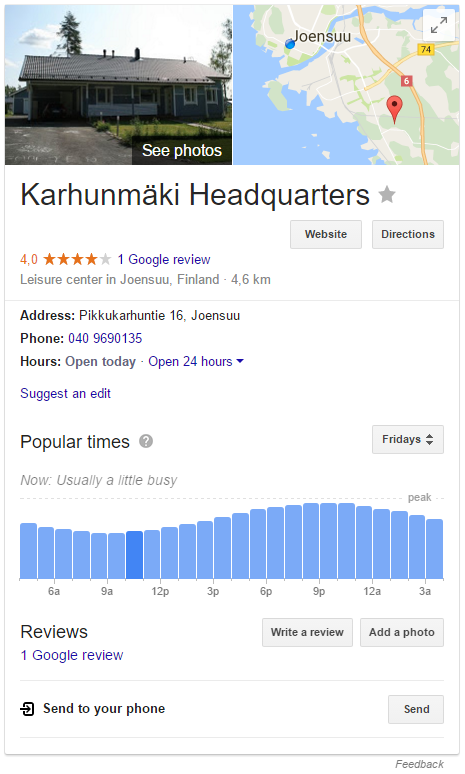 Please note that Karhunmäki Headquarters is usually a little busy. From Joensuu City center: Cross the Pielisjoki river using Suvantosilta bridge. Head towards Niinivaara District via Niinivaarantie road. At the traffic circle next to Eväskontti Emporium follow the directions towards Reijola. 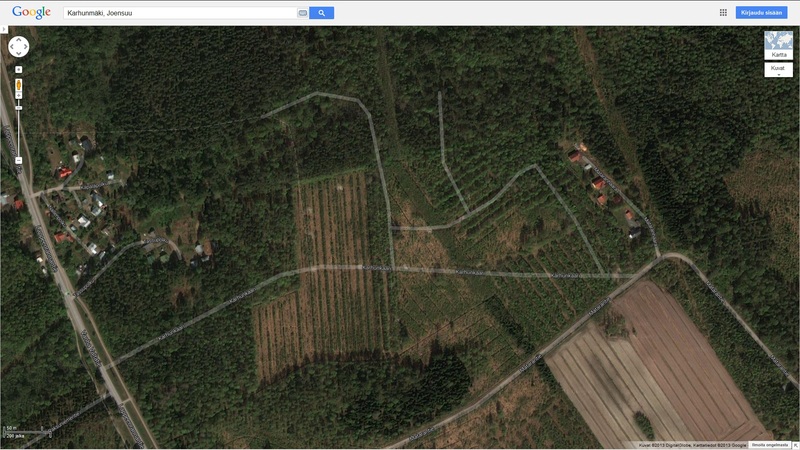 Drive 1.7 kilometers straight, and when you see the sign "KARHUNMÄKI" turn sharply left on Karhunkaari road. Follow the road until you cross the overpass, then turn left on the next intersection, on Pikkukarhuntie road. The Headquarters are located at the end of the road, the second-to-last Mansion on the right (# 16). From Superhighway 6: Take the Karhunmäki junction (# 30) on the Superhighway 6. Head towards Karhunmäki following the Karhunkaari road. Turn right on the fifth intersection, on Pikkukarhuntie road. 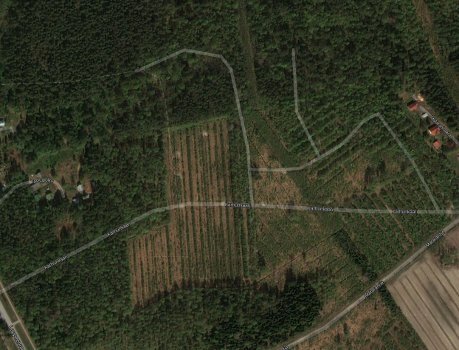 The Headquarters are located at the end of the road, the second-to-last Mansion on the right (# 16). Female Bear posted new recipies. 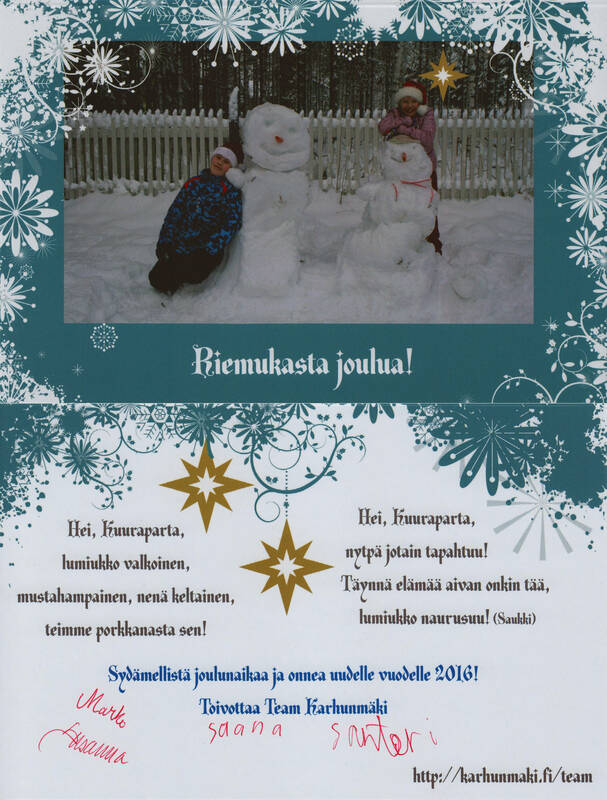 Team Karhunmäki wishes merry Christmas! The Official Karhunmäki Store has been opened! Karhunmäki Slow TV is here! Team Karhunmäki wishes joyful Christmas! Updated information about Team days 2015 event (Romo). 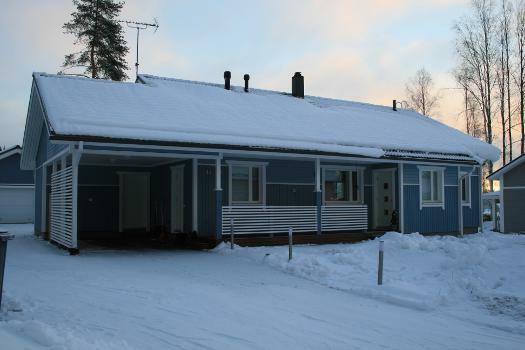 Added information about Team days 2015 event (Mekrijärvi). Published the Karhunmäki Neighborship Program. Added information about Bike Show 2014 event. Added information about SpeedParty 2014 event. Added image slideshows and more pictures of the vehicles on the Team Karhunmäki page. Added the story of the Male Bear. Released the new layout of the site. Karhunmäki Campus (see also) was on time and according to what was planned!